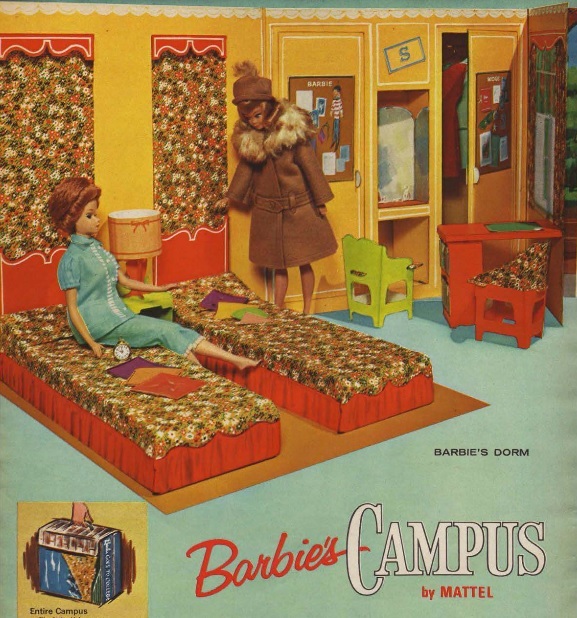 The campus playset was part of a whole line of college-themed accessories for Barbie, and given ample page space in the 1964 Sears Wish Book. I wish Mattel had pursued the concept through the entirely of Barbie’s college experience — Summer of Love Barbie, Berkeley Speed Freak Ken, Bad Acid Trip Barbie with Plush Sanatorium for her mysterious “year abroad,” Nixon Campaign Volunteer Skipper, Bearded Drop-Out Ken with Authentic Draft Evading Action, and Weather Underground Barbie with Home Bomb-making Kit and Federal Wanted Poster. Y’know, to give the kids of America something they could really aspire towards.